When the Alaska Board of Game recently doubled the wolf bag limit for Nome, its published justification was "Wolves are highly valued by local hunters for their fur and for the prestige associated with taking wolves." Prestige is another word for bragging rights. 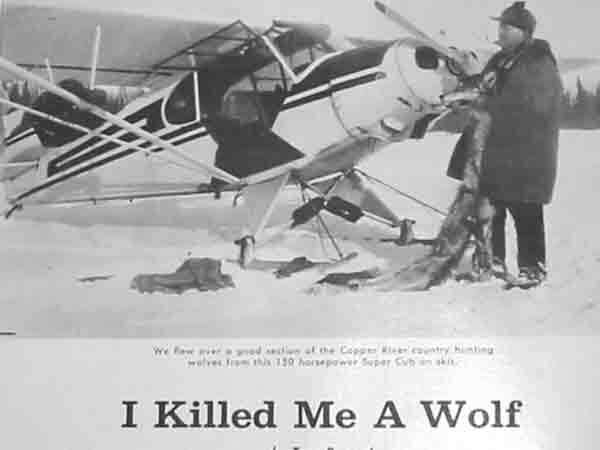 Although in a televised debate, Alaska Senator Ralph Seekins said the aerial killing of wolves is to be done "surgically, effectively, and humanely as possible," history proves the practice to be otherwise. William S. Munz, an aerial wolf hunter in the 50's recalled that on one occasion he had to pump three loads with a .220 Swift into a black wolf running at right angles "and it didn't drop until the third shot." (The Alaska Sportsman, Dec. 1955) "Then it just slowed down," Munz went on, "and finally dropped half-leaning against a snowbank. It seemed unlikely that I could have missed at such close range, and a close examination proved I had not. A small wad of black fur marked the exit of each bullet when it came out on the opposite side. The tiny steel-jacketed slugs, traveling at their maximum velocity, passed through the wolf's body almost like needles. Because they were body shots which did not damage the bone structure, it was several seconds before the reaction set in and finally stopped the wolf." As of this--my third--Wolf Alert, 14 wolves have been reported killed under the State's predator control program. The news only just came out about these killings in the Nelchina Basin; residents received it by word-of-mouth and passed the information on to the media: the Alaska Dept. of Fish and Game did not have the wherewithal to issue a press release. The Department knows the issue is of interest to many Alaskans, yet seemingly is too cowardly to present the news in a forthright manner. Alaskan's do not want aerial wolf killing in their state: first in 1996 and again in 2000, we voted to ban it and our wishes were honored up until the election of Governor Frank Murkowski. Murkowski also handpicked members of Alaska's Board of Game, a collection of hunters, trappers, Big Game Guides, and small-plane pilots with the power to determine Alaska's hunting seasons and bag limits. (They may even benefit financially from guiding and flying as aerial wolf hunting continues in Alaska for years.) The point is: they view wildlife as something to be managed for eventual harvest and sport. 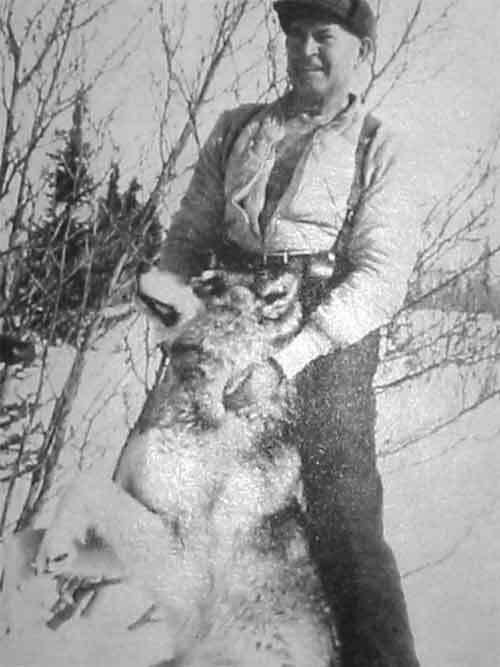 Ronald Somerville - A spokesperson against Alaskan Native desires to maintain subsistence living lifestyle and Director of the Alaska Outdoor Council (AOC), an organization with a long history of supporting aggressive predator control. Ben Grussendorf - A hunter and fisherman who claims to enjoy wildlife viewing, and "exploring with the hound." Sharon McLeod-Everette - A registered Big Game Guide and Lifetime National Rifle Association member. Mike Fleagle - Chairman of the Board of Game; a self-professed lifelong hunter and trapper who has always sponsored wolf-control programs. Ted Spraker - Spraker is a known as a longtime advocate of bear baiting as a sport; he describes himself and his family all as Big Game Hunters, and is a member of the National Rifle Association and Safari Club International. Cliff Judkins - Owner and operator of a lodge. Pete Buist - An activist for aerial land-and-shoot hunting of wolves and past-president of the Alaska Outdoor Council which favors control of predators who complete with hunters for moose and caribou; Buist is also an Alaska Master Guide, past member of the Alaska Big Game Commercial Services Board, and nine-term president of the Alaska Trappers Association. Thanks to recent changes by Murkowski's Board of Game, hunters can now legally use snowmachines in vast regions of Alaska to run wolves to exhaustion before killing them. Adding to the adventure, in some areas, airplanes overhead can spot wolves and cell phone the news to buddies on snowmachines below, like some kind of elaborate life-sized video game. I'd like to pay tribute to Paul Joslin, Vic Van Ballenberghe, and Tom Talasz who donated their time to review this Wolf Alert for accuracy. Thank you for any aid you can give to Alaska's wolves.